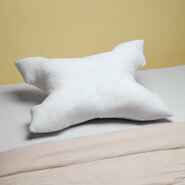 Pillow for sleep apnea is specially engineered for comfort and safety compliance. 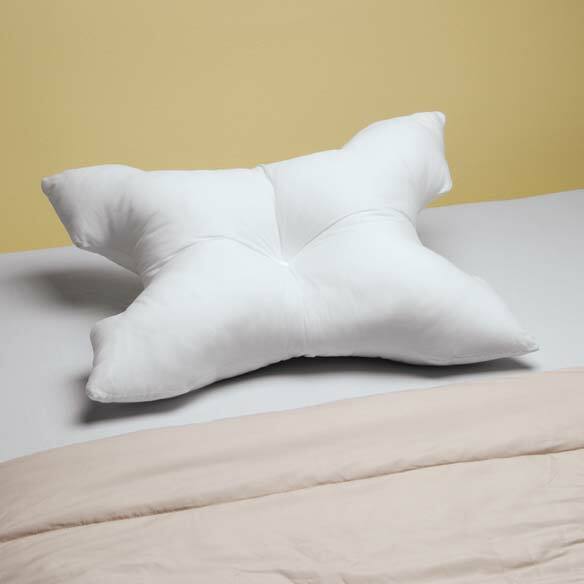 This modern cpap pillow helps keep C-PAP or Bi-PAP mask in place, preventing leaks and pressure points. The perfect solution for multiple sleeping positions, its innovative design provides comfort for sleeping. Features polyester fill. 23" Long x 18". Made in USA. I have stopped temporarily using the CPAP machine but continue using this pillow. It "snugs" my head in place and is very comfortable. I use a regular pillowcase on it. PILLOW WORKS ON RESTLESS NIGHTS AS WELL AS PEACEFUL ONES. HELPS TO KEEP HEAD IN PROPER POSTION WITH MASK ON. I use a c pap nightly. have never been perfectly satisfied with pillows I've used in past, no matter the price. I was leary when purchasing this pillow for fear it would not be up to par. 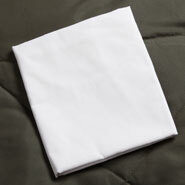 I was pleasantly surprised with the quality and comfort I received with this product. The case that I ordered at same time is just perfect. Thank you so very much. The pillow works well for me. I have a mask that covers mouth and nose. The cutout on either end of the pillow works well for me to put my face into and still be supported by the pillow and the mask won't slide to one side and leak. I like what the pillow is filled with. It's just like a pillow I would normally use. Just what I needed to help me get used to using CPAP. I only wish I had bought the pillowcase cover with it at the same time. I ordered this pillow for my husband as he uses a CPAP and the hose kept coming off when it snagged against his pillow as he was sleeping. Since he has been using this pillow this past month, he sleeps better and has no more struggle to keep his cpap mask on because it doesn't snag on this pillow. I don't use a cpap but I tried out his pillow and found it cradled my head, supported my neck so much better than the curved microfoam pillow I use for sleeping. Therefore I am ordering this pillow for myself plus the pillow cases that are designed for this pillow. I love this pillow because it is so soft yet firm enough to support my head. No more morning headaches and cramped neck! I did bye it agan. Most comfortable. Able to sleep better with the use of CPAP. It was bought for husband. 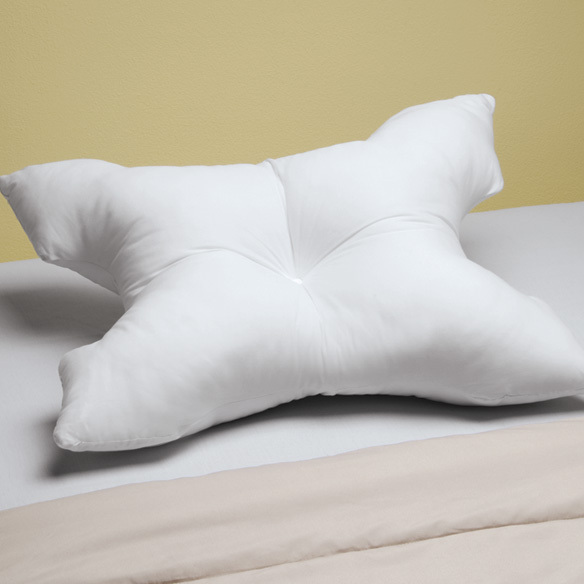 My husband uses this pillow, I can tell he really likes it, it has a place cut out for the mask to set it, so therefore it's makes the sleeping so much more comfortable. Had trouble with sore neck. It has relieved so I get a great nite sleep. Use this pillow every night. Have been using the original one for nearly 2 years. It still Looks and feels like new and just bought another for travel. I use a regular pillowcase. Same comments as for pillow case. Has improved my husband's night sleep, Mask does not seem to leak, hoses stay in place. I bought this pillow for my husband, who is a new CPAP user. He is a side-sleeper, and before he got the pillow his mask slid to the side one night. Since getting and using the pillow his mask stays in place. I asked him specific questions about using this pillow, and those were his answers. Had it for a couple weeks now. Much better than what I was using before. Will see how durable it is over time. May want to buy another. This pillow is perfect for use with my CPAP machine. I think even if you don't use a CPAP machine it would be a very comfortable pillow. So glad I purchased it. I use this product with my CPAP machine. The hose lays nicely in the cutout section. I wasn't sure when I ordered this pillow whether I would like it, but had seen a similar pillow at a home health care store which cost twice as much. It took 2 nights before I realized that I was sleeping better and not waking when I wanted to turn on side because cpap tube moved with me, rather than waking me. I highly recommend this pillow, especially for side sleepers. Quality of pillow seems good. Is full with firm support. Did not work for me as a side sleeper. If you stay on your back, and have the CPAP hose off to the side, probably would work pretty well. Leaked stuffing after 5 nights of use. This pillow was used a twice by my son in law, for whom I originally bought it. It didn't help him, so it was put away for several months. My husband then learned he had sleep apnea and tried it last week for 2 or 3 nights. The fabric on one of the corners has pulled out of the stitching, leaving a 3 inch gap where the stuffing is coming out. When I called to ask if I could send it back for a refund, I was told we had kept it too long for a return. I am very disappointed with your customer service. I needed a new cpap pillow. To help me with air leaking from my sleep apnea mask. May solve a CPAP problem for me? I suffer from Sleep Apnea and this helps me to get comfort while I sleep. Use cpap and hope this will relieve pressure near face. my husband has sleep apnea and i heard these pillows help alot so i wantedto try one. I need it for my ear. ive always had good luck with anything Ive purchased from easy comforts. My daughter loved the last one I ordered. My husband has sleep apnea and can't find a comfortable pillow, we are hoping this will help him. Is there a pillow case for the pillow? BEST ANSWER: yes, but you don't really need it. regular pillow cases work fine. Is it hard or soft ?